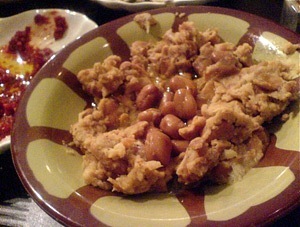 Named for its Isreali chef-owner, Gazala Halabi, Gazala Place is a narrow, friendly restaurant that specializes in Druze cuisine. Followers of an ancient sect that branched off from the Muslim religion, the Druze played a little known yet very important role in the politics of Syria and Lebanon, and a small community continues to live as a distinct, designated ethnic group in Israel. This New York outpost is barely wide enough to slip through walking sideways, and of course, its handful of tables are often full. Up front is a special curved griddle for making pitaâ€“a lovely bread that does not at all resemble the convenient sandwich pockets many of us conjure. 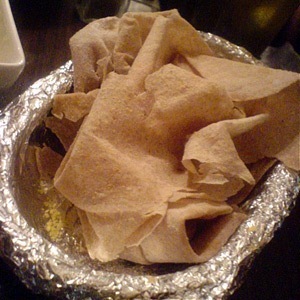 Rather, the housemade pita is a thin, delicate expanse of crepe-like bread, an edible whole-wheat handkerchief that piles and folds and wraps around an endless array of Gazala’s savory bites. The food, billed as authentic Mediterranean, leans more toward the Middle East: amazingly tender kababs of lamb, chicken and beef cooked over a searing flame, expertly shaped kibbe, and flakey pastry pies filled with spinach or feta. Absolute must tries on the appetizer menu include the brilliantly red â€œTurkish saladâ€ made from sun-dried red peppers, the luscious goat-cheese labanee spread, and the foule moudammas, a garlicky dip made from fava beans. All are properly, generously drizzled with fruity olive oil. Fortunately, there’s no end of bread refills for scooping up the vibrant flavors. While you’re finishing your meal with date cake or honey-soaked kenafi accompanied with thick, strong Arabic coffee or a pot of the minty house tea, expect Gazala herself to stop by your table to chat. She might not tell you her secret recipe for that unforgettable red pepper spread, but her friendly smile will be the perfect cap to a unique lunch. In the past couple of decades, West 32nd Street between Broadway and Fifth Avenue has sprouted neon galore. This main strip of Koreantown, once the source of wigs and fashion accessories became known informally as Kimchi Alley and more officially as Korea Way. It’s a business district onlyâ€“look to Flushing for Korean residential enclavesâ€“but this is still the street to come in Manhattan for mandoo dumplings, oxtail soup, soju bars, and both Pinkberry and Red Mango duking it out on the frozen yogurt front. Koreatown has built up, literally, so second, third, fourth, and even rooftop businesses are the places to be. Getting to a table at hot spot, Bonchon Chicken, requires trekking a creaky, questionable walk-up that magically opens to a sleek lounge of distressed concrete and pulsating music. 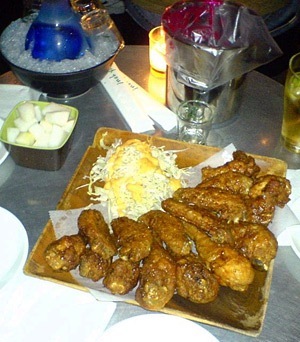 Young Koreans in date mode, sipping elegant cocktails, belie the real reason everyone comes to this hip lounge bar: the fried chicken. Made to order, Bonchon’s claim to fame is an unassuming plateful of crisp skin, juicy dark meat (pick wings or drumsticks), and a choice of garlic or spicy glaze. Sweet-tart daikon pickles and a cabbage salad offer some foil, but beer or soju is the popular complement. There’s an extensive menu of savory nibbles, and while everyone means to try the other stuff, a quick look around the room reveals the inevitable platter of chicken. For those who prefer to converse without shouting, ask for a table in one of the back rooms or settle for a seat at the bar. The lounge up front, though, is the main scene.